Schenck and the owner worked together to come up with a fitting design. “He has very good taste and knows what he likes,” Schenck explains. 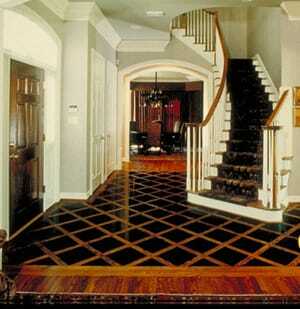 A herringbone floor and a custom parquet pattern were among the floors considered. “We tossed around five or six different concepts. I had to bid all of them,” Schenck says. “I remember thinking, “I hope I’m not going through all of this for nothing.” When the owner said he would like to incorporate some stone in the entryway, they went with this grid – or basket weave – pattern. The existing entryway strip and its screeds were pulled up and new screeds and plywood were installed. The entire wood floor, including the existing floor, was sanded and finished with plywood inserts for the granite areas; when it was all done, the 12-inch-square stone was installed. The grain was popped and a dark stain colors the clear plainsawn red oak to match the rest of the traditional-styled home. Uba Tuba marble was carefully selected at a local stone supplier to match other existing areas of the home, such as a powder room vanity. The unusual marble has a three-dimensional quality to it. The meticulous work paid off: “The home owner’s real happy,” Schenck says. “He said it turned out much nicer than he anticipated.” Schenck is real happy as well, as the floor earns his first Floor of the Year award.